Welcome to Fish Window Cleaning serving the Portland Metro Area! We have 3 locations in Portland and surrounding areas ready to serve your home or business! Having your windows professionally cleaned is one of the best things you can do to enhance your home's atmosphere. We clean all types of interior and exterior windows, including windows up to 3 stories. 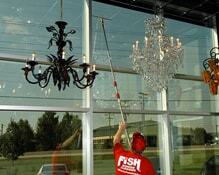 We can even clean your gutters, shine your mirrors, and make your chandeliers sparkle! Our cleaners protect your flooring by wearing clean shoe covers and using cloth pads underneath your windows. We'll even introduce our team to you before we begin so you'll know exactly who is giving all of the glass in your home a spectacular shine! As the largest window cleaning company in the world, we understand the needs of businesses. We understand that you're busy and need a window cleaning company that can work around you. We can customize our programs to meet your needs, budget, and schedule, offering cleanings ranging from weekly to annually. We can help brighten your office, restaurant, showroom, lobby, and more! We are licensed, bonded, and insured. Let our uniformed team of professionals take care of making your windows and doors shiny and spotless.